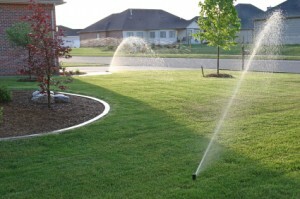 Possibly your quickest return investment of the various water saving products. A rain sensor is normally attached to a gutter on your home or garage where it can experience the maximum exposure to rainfall. Great when those unexpected showers happen or when out of town for an extended period of time. We use five various models, three by Hunter, one by Irritrol and one by Rain Bird. As with the timers, your specific requirements determine the overall best choice. Controls the system at a more precise level than the rain sensors. The on-site monitor calculates how long each section should water for based on current rain fall amounts, temperature, slopes and soil conditions. After proving their worth for years at large commercial and recreational watering systems, their technology has reached the residential field. Still somewhat â€œpriceyâ€ but their significant savings in watering eventually becomes a big plus. Some boast 25% to 60% water savings. They detect excess water flow, caused by leaks and broken heads, then override the timer to shut down the system. Like the weather station, they are a little â€œpriceyâ€ but when called upon, the water savings can be huge. At this time Hunter is the only company we know of that manufacturers this type of device.